Hi friends, how the month of february dealing you so far? Hopefully it's all pretty good and you are all in good health. Like Christmas, this february month of love adds a bit of excitement in day to day living, don't you think so? Or maybe i'm just a woman who always into celebration of things. (?) Love the feeling of anything that makes someone happy, maybe if this is a birthdays or weddings, baptismal, anniversaries,name it! Always looking forward for time of get together and sharing memories. That what life is all about, for me, i guess. Since get together and celebrations means sharing memories and happiness, it's also in some way gift giving or something i always called "give to self". Did some of you do that? Like kind of reward for a hard days of work, or some pretty things to buy to perk you up from a tiring days and months of work? Well that formula is quite applicable to the one's who's writing here. And-for-that, i did some HEART day picks of some on my favorite list to share. Le Creuset oval french oven. A must have for someone who have passion and love for cooking, even great for those who like collecting kitchenwares. Seeing this online makes me palpitate, or maybe i just did! Perfect from oven top, to stove top and direct to table top. It has a variety of vibrant colors to choose from i must tell. This soleil is also a perfect color, an eye catcher, and have summery feel. L'occitane shea handcream. As a working and hands on mom having variant of good hand products is just fine. A handy place where you can apply creams everytime your hands contacts with water helps a lot to keep away from dryness. Nars radiant creamy concealer. The first time i saw this means putting it on my list and a must try product. A concealer is a beauty essential for me as well as skincare around the eyes. It both gives life to tired looking eyes. Anthropologie mugs- how i wish this pieces can easily be bought here in the Philippines. For sure i will purchase almost all the mugs that i wanted. Looking at their sites is like unwinding from time to time. However, for the meantime i will just wait for a relative to purchase one or two for me or maybe let hubby do the honor. Yay! can't wait to pour a cup of coffee and sip through it. Love. Someone who loves beauty and cooking, that will do all my picks. Hope someone out there can totally relate on my list. Advance happy heart's day, and to all who's birthday fall this month, happy birthday too you all. This l'occitene handcream is really expensive but i never got the chance to try it out. It's actually hydrating and moisturizing great for dry skin. The cream also penetrates easily one good point of having a none greasy effect after application. i like everything you picked! 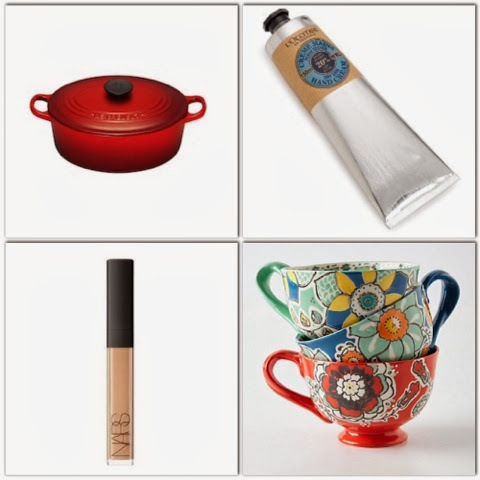 love l'occitane creams, and i love cute cups, and i've always loved those le creuset cookware, but it's so expensive! hope you and the family are well! !